UPDATE: I just became aware today of JCPenny’s reintroduction of appliance sales a few months back in January 2016. Almost exactly two years after I published this suggestion below about letting companies die and brands to evolve. In recent years there has been a push to humanize brands and make them resonate with current consumer habits. The catalyst for this shift has primarily been the balancing effect social media has had on the company/customer relationship. At this point the conversation is fully a two-way dialog and successful companies have been shaping their brands to create engagement with customers. In addition to the trend of humanizing brands, companies are now recognized as corporate citizens – people in the eyes of the law. This fact causes angst in some groups and celebration in others but neither understands the true result of this development. People age and die. Companies are people. Companies can age and die. This is a fact of life. It is also another step in the evolution of corporations and capitalism. The earliest corporations were highly regulated – they were charted by governments, given a specific purpose, and dissolved afterwards. Corporations have evolved over the last 300 years to be allowed to exist in perpetuity. Does that mean a company must live forever? Ullman like other CEOs in his position are tasked with making companies profitable again, but in our evolving economy is that the most valid goal to pursue? Is focusing on the corporate entity as whole the best way to create the most value? JCPenney and all companies in the retail industry are nothing more than on-site consumer product distribution centers. Nothing more or less… consider today how many consumer products are distributed from warehouses that the customer never sees. Yes on-site distribution centers provide a customer experience and create brand connections – but they’ve also created the showrooming phenomenon that has hurt their profitability. What if we separate the brand from the company? What if the corporate entity that James Cash Penney created was allowed to die and it’s primary asset, the JCPenney brand was marketed in a completely new fashion? What if a retro or specialty JCPenney product brand was re-introduced and made available at some other retail distribution center that is performing better? This brand adaptation would retain value that will otherwise be lost in a liquidation, buy-out, or merger. Like real people, the corporate entity with it’s aging culture, management, and infrastructure, would eventually die. However, the family name, the brand, could live on. Like desires of real people this would allow companies to die with dignity having the knowledge that their brand name would live on and continue generating value. 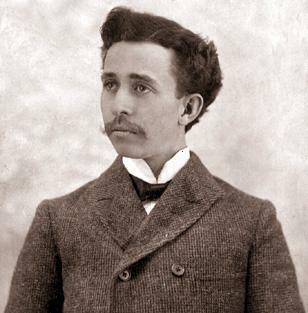 Just looking at Penney’s 1902 photo has to inspire one to consider the high end branding opportunities that could be created around a 27 year old American entrepreneur.